There was one signing no one will ever regret in Madrid. In 2012, the Merengues brought Luka Modric to the Spanish capital and it didn't take long for the Croatian to establish himself as one of the most important players in the club. 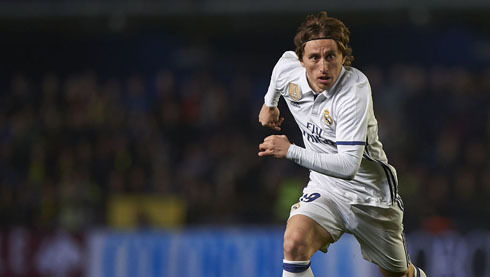 Much maligned by the very demanding Madridistas in his first six months, even being panned as the worst signing of that summer, it took Modric time to adjust from a truncated pre-season and to find his way into the starting XI at Real Madrid under manager José Mourinho. But he maintained focus and by the end of his first season, he had won the confidence of both the fans and the manager. Brilliant performances, like the one he gave in March of 2013, when he was brought on as a substitute against Manchester United and effectively turned the Champions League quarterfinal tie around, displayed his calmness under pressure and his ability to make plays and to take chances with powerful long-range shots. While poor performances at Real Madrid are never dismissed, great performances sometimes are. Modric struggled to find a place for himself in a midfield already packed with talent, but he did not panic, nor complain, nor doubt his own abilities and this has earned him the respect of his teammates, his fans and his managers. By the following season, Modric was a regular starter under new head coach Carlo Ancelotti. He made over 40 appearances and had an incredible average pass accuracy of 90%. In April of the 2013-2014 season, Real Madrid defeated rivals FC Barcelona in the Copa Del Rey final, thanks to a now legendary goal scored against FC Barcelona by Modric's old Tottenham teammate and new record-breaking Real Madrid signing Gareth Bale. Modric dominated the Champions League campaign, controlling matches from midfield and taking apart some of the best teams in the world. Madrid reached their first Champions League final in 12 years. In the 93rd minute of the final, when cross-town rivals Atletico Madrid looked sure to win, Modric stayed as cool as ever and sent a beautifully placed corner into the lurking head of Sergio Ramos, who scored the equalizer and inspired the comeback victory. 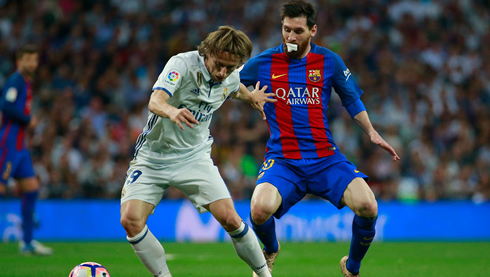 Modric's influence and leadership on the pitch can be measured by how noticeable his absence is. In the 2014-15 season that followed, Madrid's biggest signing was Colombian midfielder James Rodriguez, a relatively unknown youngster from AS Monaco. He cost the club more than twice what Modric had and he nabbed the coveted number 10, which surely should've been reserved for the Croatian veteran. Nevertheless, Modric's number 19 proved too big to fill when he spent three months sidelined from an injury sustained while making an international appearance for Croatia. Madrid had started the season by winning the UEFA Super Cup and went on a record-setting 22-game win streak, that ended not long after Modric's injury. And even despite many of those matches being wins, fans were often disgruntled at the lackluster, sometimes chaotic performances. Other Madrid midfielders, while capable of great performances, were hampered by their need to make an impression, to stand out. 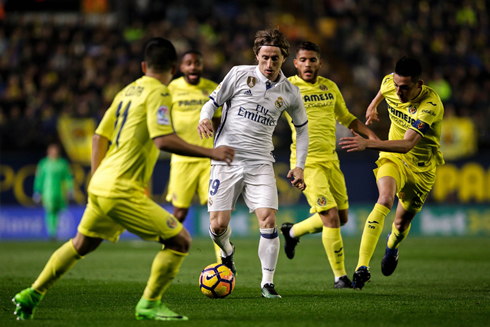 Modric continued to start through the short rain of Rafa Benitez, and was highly praised by the new headcoach and former midfield maestro Zinedine Zidane when he took over. And no doubt the end of Zidane's first and second seasons are still fresh in the minds of fans, bringing back-to-back Champions League titles and Modric's first La Liga title. Under the supervision of Zidane, Modric's impression on the style and movement of Real Madrid's play has been even more powerful, but, like most of the great footballing artists, his impression is camouflaged. And that is a shame, because while masters like Ronaldo and Messi surely deserve all the acclaim that they receive, there is and should be room for others to get the recognition they deserve. It's great for business to have a massive rivalry like the one they've manufactured for Ronaldo and Messi, but it is also great as a fan of the beautiful game to put rivalries aside and appreciate the work of those that make the sport worth watching. In 2010, Dutch midfielder Wesley Sneijder should surely have been a contender for the Ballon d'Or. In 2012, Spanish midfielder Andres Iniesta had all reason in the world to win it. Modric's Croatian teammate Ivan Rakitic was brought to FC Barcelona for a modest sum and he too has earned his keep by quietly leading them to trophies. But it seems the conductors often go unnoticed, without the huge transfer fees and the fanfare, contented far more by their contribution than by their recognition. The priciest players do not necessarily have the biggest impact. If that were true, Paul Pogba surely would’ve led Manchester United to at least a Premier League title by now. In Modric's five years with Real Madrid the club has won ten trophies. Their previous ten trophies had taken ten years to accumulate. That means that during his tenure, Madrid has doubled their winning rate. The Ballon d'Or battle will surely continue to rage between Ronaldo and Messi. But it must be some small consolation that, in the season ahead of us, Luka Modric will rightfully be donning the number 10 at Real Madrid. Cristiano Ronaldo next game is a pre-season fixture on August 2 of 2017 against MLS All Stars. You can watch Juventus live stream, MLS All Stars vs Real Madrid, Barcelona vs Chapecoense, Valerenga vs Manchester United, Liverpool vs Atletico Madrid, and Bayern Munich vs Napoli, all matches provided from our stream football game pages.